In this release, the software has been extended to support easier integration into existing Python installations on macOS, Microsoft Windows, and Linux operating systems. In addition, the version numbering system has been adapted to reflect major and minor changes to the software. DEVSIM® is available from https://devsim.org. The site include more information for those who wish to use or participate in development of this software. DEVSIM LLC was founded in 2008 to provide TCAD simulation software and programming services. For more information, please visit https://devsim.com. DEVSIM® is a registered trademark of DEVSIM LLC. All product names, trademarks and registered trademarks are property of their respective owners. This entry was posted in Announce, DEVSIM, EDA, Open Source, TCAD on December 18, 2018 by Juan. This entry was posted in Announce, DEVSIM, TCAD on September 12, 2018 by Juan. SISPAD 2018 will be September 24-26th in Austin, TX. The SISPAD conference series provides an open forum for the presentation of the latest results and trends in process and device simulation. The conference is the leading forum for Technology Computer-Aided Design (TCAD) and is held alternatingly in the United States, Japan, and Europe in September. This entry was posted in Announce, TCAD on July 29, 2018 by Juan. This entry was posted in DEVSIM, Open Source, TCAD on July 20, 2018 by Juan. 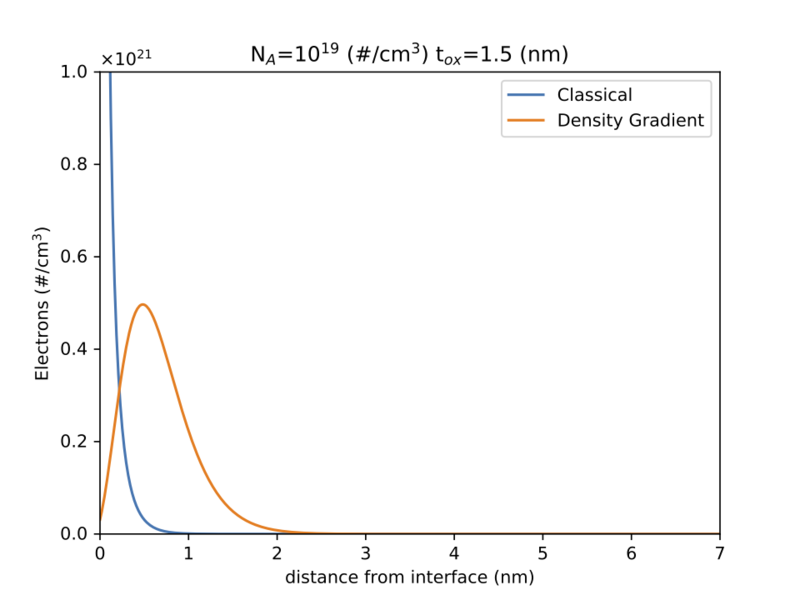 The Density Gradient Method has been implemented as a simulation example for DEVSIM. 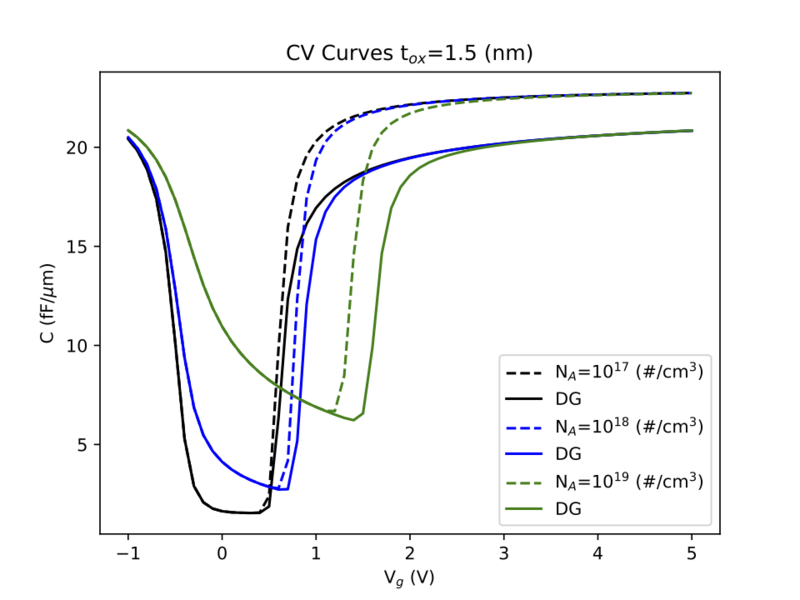 This method is a quantum mechanical correction for carrier densities near a semiconductor/insulator interface. The example scripts simulate both a 1D and 2D MOSCAP structure. The scripts generate plots to visualize the results. It can be downloaded from https://github.com/devsim/devsim_density_gradient. This entry was posted in DEVSIM, Open Source, research, TCAD on May 13, 2017 by Juan. Semiconductor Device Simulation Using DEVSIM is now available from our site. DEVSIM is a technology computer aided design (TCAD) simulation software. It is released under an open source license. The software solves user defined partial differential equations (PDEs) on 1D, 2D, and 3D meshes. It is implemented in C++ using custom code and a collection of open source libraries. The Python scripting interface enables users to setup and control their simulations. This entry was posted in Announce, DEVSIM, TCAD on February 11, 2016 by Juan. The DEVSIM source code is now released under the Apache License, Version 2.0. It was previously under the LGPL 3.0. The license change is intended to promote adoption of the software and attract new contributors. A brief synopsis of the license is here. The spirit of the Apache License is also more in line with the license terms packages that DEVSIM relies upon. More information about DEVSIM is available from https://www.devsim.org. This entry was posted in Announce, DEVSIM, EDA, Open Source, TCAD on February 6, 2016 by Juan. The article is freely available for download via open access. It covers how to avoid many of the pitfalls in using Verilog-A compact modeling. It is unclear if this might be related to the effort described in our previous post. This entry was posted in compact modeling, EDA, SPICE, verilog-a on January 1, 2016 by Juan. One of the other sites I manage is TCAD Central – https://www.tcadcentral.com. It is a resource concerning TCAD and semiconductor device simulation. Some of the content is no longer current. Please let me know if you have any updates or news in this blog or on the TCAD Central site. This entry was posted in Commercial, compact modeling, EDA, Open Source, SPICE, TCAD on October 15, 2015 by Juan. An interesting project from the IuE Summer of Code 2014 is a collection of 3D CAD models. On the CAD models page are examples of these devices. Using the FreeCAD open source CAD modeling software. The student created these models from examples in the literature. There are also tutorials at the bottom of the page for building a Double-Gate MOSFET and Tri-Gate devices. This entry was posted in Announce, Open Source, TCAD on December 13, 2014 by Juan. © 2008-2018 DEVSIM LLC. All Rights Reserved. DEVSIM® is a registered trademark of DEVSIM LLC.